So what if the summer in our country is not as pleasant as the other countries? We are sure that our brides are able to beat the heat and set themselves in a perfect summer look to rock the wedding aisle. What makes us say so? Well, we have a few ultra-gorgeous latest bridal lehenga ideas for summer that are minimalist but perfect for a summer special wedding. They are subdued yet cheerful, contemporary yet ethnic and are the right blend of glitz and poise. Are YOU planning to get hitched in a summer month? This article would be the ideal place for you to draw some major inspirations. So, read on! Well, that could be the best way to describe this beautifully designed lehenga for summer. 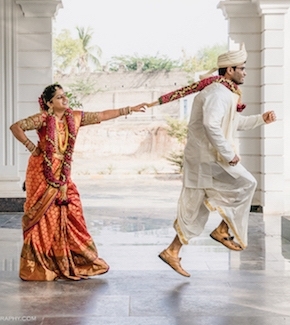 Besides being a trendy, modern bride, you can try different. If you want to carry your traditional style on the wedding night, this stunning lehenga is for you. The sorbet color to the exquisite silver zari design with a pop of subtle meenakari. Which makes this perfect for the summer brides. Moreover, its off-shoulder blouse has added a twist to the style and is sure to lend the necessary comforts in the heat. Who says red is not the colour for summer? Will you still believe that red is not the color for summer after looking at this lehenga? The right blend of glamour and poise of this bridal lehenga has doubled. The elegance of the colour red without making it ultra loud and dazzling. In addition, the multicolour floral motif all over the skirt has added a charm to the attire and the off-shoulder shimmery blouse has taken it to a whole new level. So, all the brides-to-be who are still indecisive about wearing red in summer. And the ones thinking about bridal lehenga ideas for summer. Just go ahead and pick an elegant piece of red lehenga for your D-Day to give a pleasant stunt to your guests. We believe that wedding is the most important event of life. 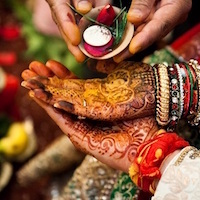 The brides have every right to experiment with their trousseau and style (definitely without ignoring the tradition and culture). 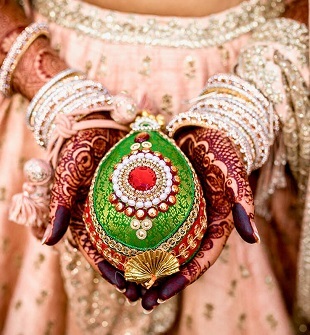 So, do not hesitate to play around with colours even if you are getting married in one of the scorching summer months. You can team a royal blue skirt embellished with a multi-coloured floral design. Along with a pitch colour off-shoulder cape style blouse to exhibit your unique style. To enhance it further accessorize it with trendy jewellery and steal the spotlight of the D-Day. Well, it’s absolutely fine if you still want to stick to a light shade of bridal lehenga choli. After all, it’s your D-Day and your wish should be our command. So, we have carefully handpicked a pitch colour lehenga adorned with intricate bronze zari work all over the skirt and the blouse. While light and sophisticated hue of the lehenga will add a touch of finesse to your summer bridal look. Its muted zari work will reflect your subtle style on the other. To add a further bling, go ahead and pair it with a statement set of jewellery and create the necessary impression all around. So our dear readers, do let us know how did you find our bridal lehenga ideas for summer in the comment section as we are open to any ideas/ suggestions/improvements.